Fences For Fido volunteers — from right, Stacy Burnett, Sue Schroeder and Karyl Hansen — secure a new fence to the ground in August at a Vader home, providing a safe yard for a family’s seven dogs chained outside. Fences For Fido built a fence at a Longview home in October so this pitbull and another one could enjoy life unchained. A Portland-based group that builds fences for dogs chained outdoors is in “desperate” need of crew leaders and volunteers for Southwest Washington projects, Fences For Fido team members said. In addition, the group is seeking an extra-large, insulated dog house for a Great Dane/lab mix that’s awaiting a fence in Castle Rock, according to Dolores Handy of Longview, Fences For Fido’s Southwest Washington coordinator. “Unfortunately, we can’t find anything that big, and we can’t build his fence until we get a shelter,” Handy said last week, adding that the insulated dog houses built by a Salem volunteer aren’t large enough for the giant dog. Fences For Fido, an all-volunteer, nonprofit group formed in 2009, is dedicated to improving the lives of dogs kept outdoors by removing chains, building fences, providing new dog houses, offering medical care and free spaying and neutering. The group typically builds eight to 10 fences each month and usually has about 20 dogs on its waiting list. The dogs’ owners aren’t charged a cent for the work, which runs an average of $600 per project, according to www.fencesforfido.org. The group is funded by donations. Most clients are low-income and cannot afford to build their own fence, but there are no income requirements. Fence projects are based on the dog’s needs rather than the family’s financial status, according to the group. Fences For Fido has built 46 fences for 81 dogs in Cowlitz, Wahkiakum and southern Lewis County. 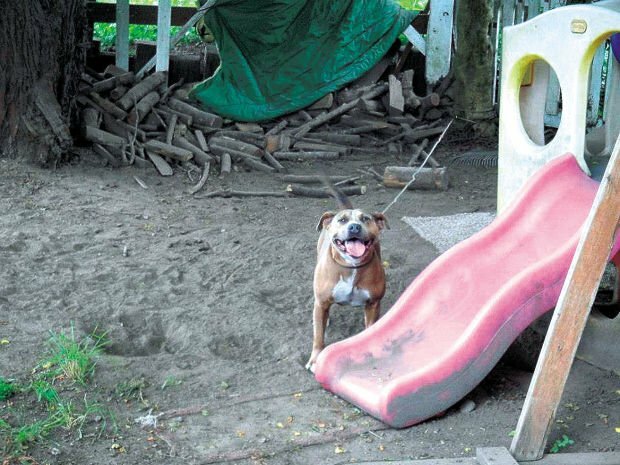 The group’s Southwest Washington chapter could help more dogs if it had more local people willing to take charge of leading fence construction projects and getting the materials, Handy said. Just on Wednesday, a volunteer discovered two painfully skinny dogs chained outside in Cathlamet by a ramshackle dog house. Fences For Fido volunteers brought over food and bedding and created makeshift shelters for the dogs until their cozy new dog houses arrive. The dogs’ owners, who said they couldn’t afford to feed the dogs enough, accepted Fences For Fido’s offer to build a fence, Handy said. Fence building “is easy,” she said. Volunteers dig holes for cedar posts and cement them into the ground. (Within Longview city limits, however, a permit is required, and a city inspector must approve the holes before they’re cemented, which adds a couple of days to the project, Handy said). Volunteers return the weekend after the post-setting to erect a wood-and-wire fence. Then comes the magic, joyful moment when the dog is unchained. Volunteers whip out their camera phones to capture the scene of doggie joy as the pup bounces around its new space. “Once they have done a couple builds, it’s almost addictive. You want to go to another one next weekend and the weekend after,” Handy said. Want to volunteer or donate? Go to www.fencesforfido.org. (No one under 18 is allowed at builds because they’re considered construction sites.) The group’s Facebook page is Fences For Fido. Questions? Call Dolores Handy, Fences For Fido’s Southwest Washington coordinator, at 360-577-7752. Since forming in 2009, Fences For Fido has unchained more than 400 dogs total in northwest Oregon and Southwest Washington. In our area, the nonprofit volunteer group has built 46 fences to free 81 dogs chained outside.